Contributed by Dr Bettina Renz. 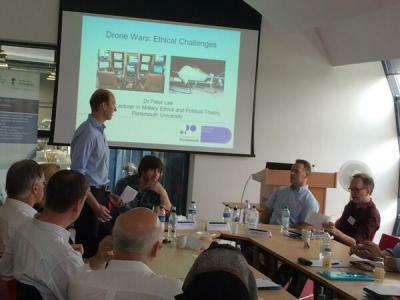 On 13th June 2014 a one-day cross-disciplinary workshop on airpower and war in the 21st century was held on the University of Nottingham’s Jubilee Campus. It was co-organised by the School of Politics and IR’s Centre for Security, Conflict and Terrorism (CST) and the University’s Institute for Aerospace Technology (IAT) with generous support from the Institute for Asia and Pacific Studies (IAPS). The aim of the workshop was to bring together a variety of scholars and practitioners from different backgrounds to discuss a wide range of challenges pertaining to airpower and contemporary conflict, in Asia as well as elsewhere. The twelve speakers included academics at different stages of their careers (from PhD student to professor) from politics, philosophy, history, law and engineering in addition to former and active air force personnel. The papers, which were presented in four themed panels, were followed by an open discussion with the audience. The latter was equally diverse and included students and staff from different disciplinary backgrounds from around the East Midlands, air force personnel and cadets from the East Midlands Universities Air Squadron. The rationale of the workshop was the idea that the roles, utility and limitations of airpower can only be understood from a multidisciplinary perspective. Political and historical studies of the subject have largely tended to focus on arguments in favour of or against strategic campaigns. ‘Strategic airpower’ is the idea, originating largely from the writings of Giulio Douhet and other airpower thinkers in the 1920s, that aerial bombardment can enable effects much bigger than the actual destruction caused and thus lead to quicker and easier victory or even win wars on its own. Proponents of this idea believe that tactical and technological improvements will steadily strengthen airpower’s prowess, ultimately turning it into an instrument able to win all types of conflicts. In contrast, sceptics hold that the role of independent airpower is distinctly limited or even counterproductive, especially in irregular conflicts and today’s era of ‘new’ wars. However, whilst there are many salient questions to be asked about strategic airpower, focus on its merits and limitations alone cannot adequately reflect the complex reality of airpower in the 21st century. For example, the role of technology in airpower is central and has attracted renewed attention in recent years with the increasing use of unmanned aerial vehicles or ‘drones’. However, the extent to which new airpower technology can have strategic effect is not merely a political question. It requires specialist knowledge of the technology itself, of its potential future developments, as well as of its limitations. Dr Herve Morvan, Research Director of the IAT, for example, emphasised the importance of distinguishing between theoretical technological possibilities and the reality of financial constraints. In other words, many of the latest high-tech platforms (for example, stealth bombers and fifth-generation fighters) are simply not affordable, or at least not in large numbers, for many European states with shrinking defence budgets. In a similar vein, Philip Sabin, Professor of Strategic Studies at King’s College London, argued that the current Western dominance in airpower technology is far from guaranteed to persist in the future. Obviously, this has implications for the current perception and use of airpower by some Western states as the political weapon of choice. Moreover, airpower has arguably influenced the debate on law and ethics in warfare more than any other form of military activity. The central legal and ethical question pertaining to airpower has been the targeting of civilians from the air. Many political and historical analyses of this issue continue to focus on area bombing during the Second World War. But this is not where the story ends. Improved technology has driven down the number of casualties and the destruction of populated areas on the scale of the Second War is not really conceivable in present circumstances. However, this does not mean that law and ethics are less important considerations for contemporary airpower. Ethical and legal concerns over civilian casualties continue to be influential on public perceptions of airpower as well as on political decisions to resort to it. The input of legal scholars, ethicists and philosophers into the study of airpower in the 21st century is therefore essential. To this end, Dr Janina Dill, lecturer and Associate Director of the Oxford Institute for Ethics, Law and Armed Conflict, discussed the interrelationship between law, strategy and morality in air warfare. Professor Nigel White, an expert in the law of armed conflict and use of force at Nottingham, raised questions about the difficulties of applying traditional legal debates and norms pertaining to airpower to new technologies and the use of drones in particular. A separate panel on ‘drone warfare’ evoked the most heated debate and controversy. One ethicist and two critical scholars sought to ‘demystify’ some of the most widely held perceptions and misperceptions, as they saw it, relating to the use of unmanned aerial vehicles. Dr Peter Lee, an expert in military ethics at the University of Portsmouth/RAF Cranwell, focused on whether the use of drones was a technology issue or a foreign policy issue and asked if a technology per se can be unethical. Dr Liam McCarthyand Rogan Collins, both taking a critical approach to security, asked why the use of drones was so controversial compared to other advanced technologies and discussed the ways in which ethics can be used both to critique and to justify the use of drones. Last, but not least, the workshop was motivated by the idea that scholars of different guises and airpower practitioners need to talk to each other. This point was repeatedly emphasised by one of our final speakers, the Director of Defence Studies and of the Royal Air Force Centre for Air Power Studies, Group Captain Paul Wilkins. Even if this relationship might not always be easy, such dialogue is required not only to ensure that the complexity of contemporary airpower is adequately understood, but also to enable the potential impact of academic research findings and ideas on the way in which airpower is used in practice.